We can neither explain nor verify this since the first class (consisting of only two people) was graduated in 1903 (57 years before ours), and consistent with that, 47 and 52 years later, the classes of 2007 and 2012 purported to be the 104th and 109th class, respectively, as if there was a graduating class every year. which would make ours the 57th class. Go figure. Click here, and you can compare the foregoing list to the entire roster of graduates of our OJHS graduating class of 1957. Even though that other list is shorter (470), there are many names there that are not here, people that you have likely neither seen nor heard in many decades. 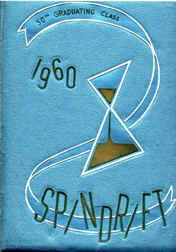 Yearbook Online For those among us who have lost their precious yearbooks as the years sailed by, worn them out or just don't want to dig them out of mothballs, this site presents a full set of senior portraits with all the commentary that accompanied them ─ 57 complete, original pages right out of your Spindrift ─ and more!! What else, you ask?? How about group photos taken from the 1958 and '59 Spindrifts of our class as sophomores and juniors? list of, and to help find, missing classmates. If at one time you were part of the class of 1960, but for whatever reason did not graduate with us and, therefore, are not on the linked list of graduates, or if for any other reason you do not receive our occasional class e-letters, nevertheless, you are invited to join our association. Please let me know by e-mail how to reach you, so we can put you on our distribution list.